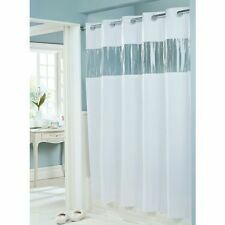 This is a White Hookless Shower Curtain. This Shower Curtain is heavyweight 8 gauge and it is mildew resistant. This Shower Curtain installs in seconds with no Hooks or Rings. This Shower Curtain does not have or require weighted magnets, it stays in place on its own. Brand new 100% cotton 72"x72" machine washable white beautiful pattern . New Disney finding Dory bath towel. Auctiva's FREE Counter. Kensington Shaggy Chenille Cotton Noodle Bath Bathroom Rug 21" x 34"
12 PIECE COMPRESSED TOWELS. 12 Pc Disposable Compressed Towels. Camping and Outdoors. Tablet Size 3/4". Food and Water Supplies. 100% Rayon. Expanded size 9 1/2" x 10". Helpful Links. Fingertip Towel ~ MONOGRAMMED LETTER F ~ Avanti ~ USA Made (NEW) . Condition is New with tags. Shipped with USPS First Class Package. The letter is in pewter / Gray. Fingertip Towel ~ MONOGRAMMED LETTER H ~ Avanti ~ USA Made (NEW) . Condition is New with tags. Shipped with USPS First Class Package. The letter is in pewter / Gray. Fingertip Towel ~ MONOGRAMMED LETTER J ~ Avanti ~ USA Made (NEW) . Condition is New with tags. Shipped with USPS First Class Package. The letter is in pewter / Gray. ( 5 1/2 feet by about 3 feet) It is 100% cotton and features the Ralph Lauren boy bear in swimsuit attire holding a surfboard. The perfect look for the beach or pool! Looking to freshen up your bathroom?. Keep the water from splashing outside the tub with our 13 piece Owl fabric canvas shower curtain with matching resin hooks in shapes of pink, yellow and green owls adding a sophisticated style to liven up your bathroom with color and designs. INCLUDES 26 DECALS. >Applies to any smooth, slick, clean, and dry surface (not for delicate or textured surfaces). >Can be reapplied to their original liner sheet for re-use at a later date or another location. Luggage & Bags (153). This responsive, sleek molded sensor soap pump dispenses 0.07 fl oz. (2 mL) touch-free. Baby & Kids' Furniture (2810). Kids' Play (539). So why buy from us?. And our friendly and knowledgeable phone staff is available 24-7! Lysol No-Touch Hand Soap System. soap type: antibacterial. includes: hand soap dispenser, refill and 4 AA batteries. Automatic Dispenser. dispenser color: white. refill size: 8.5 fluid ounces. Get our 27x16in color changing bath mat sheet. An incredibly thin novelty prank for horror lovers. Changes quickly and is such a realistic red! I scared my boyfriend quite nicely! The surface does feel papery, so it’s not one you should use regularly, but it’s good for a nice prank! New Pottery Barn Kids eyelet shower curtain only. Shower Curtain. Shower curtain hangs with key hole design. A cotton weave is a tightly woven weave, which gives the fabric a soft finish while providing durability and ultra breathability. Traditions SEASCAPE Starfish Beach Fabric Shower Curtain. Colors: Off White With Shabby Antique Blue Starfish And Trim. Machine washable, gentle cycle ~ Drip dry. 100% Polyester. Top and bottom stripe borders. “Independence Stripe ” seersucker wide stripe print fabric shower curtain – by Tommy Hilfiger. TOMMY HILFIGER – INDEPENDENCE STRIPE SEERSUCKER –. NAVY WHITE FABRIC SHOWER CURTAIN – NEW. Features contemporary wide stripe print in shades of navy blue and white –. Classic elegant striped design; this fabric shower curtain has a canvas with a loose and flowing nature. The soothing color combination adds a relaxing spa feeling. Whether you are updating your bathroom or inspired to create a new look, design, or style, this shower curtain makes an attractive choice. And bathing areas. Bath tub and shower safety. It is perfect for exercise and. flat surfaces only. This fine grade adhesive bath mat from Safe Way Traction. Fine textured film improves traction in both wet and dry areas. I WILL ALWAYS POINT OUT ANYTHING AND DO MY BEST TO DESCRIBE AS MUCH AS POSSIBLE. NO RESERVE NEVER ! color is CREAM WHITE.